Until recently, I’ve never had a particular fight with City Hall, or government in general. Yes, of course it is true that they frequently get things very wrong, they waste dreadful sums of money that is not theirs, they are often deaf to individual cries for help from citizens and customers. But, you know, so do Enron, and Exxon and Nortel and … the list goes on and on and on. Enough mud for pot and kettle all around, IMCO. But a year ago, I ran up against complete and utter failure of, first, competence, and then ethical behaviour at the municipal level that woke me up because it slapped my wife and I personally right in the face. With your patient forgiveness, I’ll tell you about it. 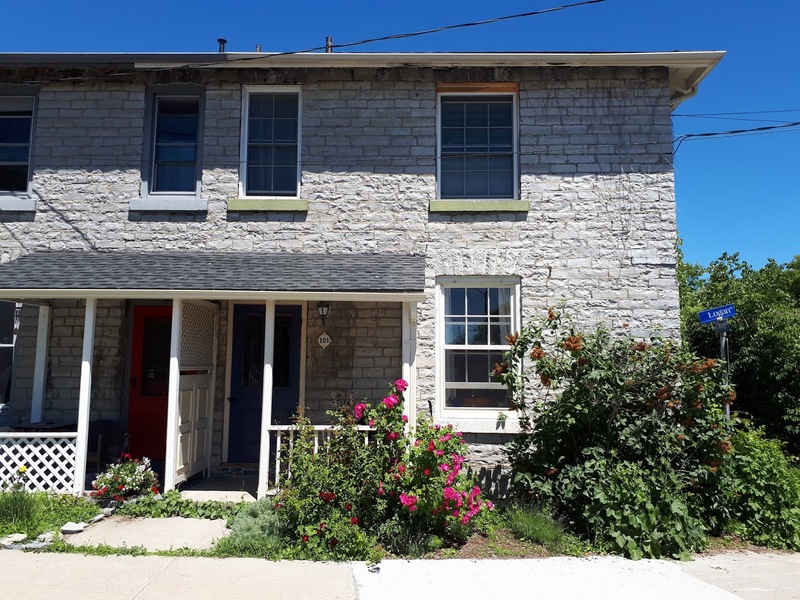 30 years ago we bought an old house in Kingston – a two-story semi-detached built in 1856 out of limestone – a familiar building material in Kingston. In Charleston or Savannah the place would be celebrated as a precious antebellum structure but in Kingston? Nah, not so much. In typical Canadian fashion, we often sneer at our own history. More on why that may be, in another blog. Built as a boarding house to provide rental income for a widow, it was listed, but was not even important enough to merit a historical designation, even though it was apparently designed by William Coverdale, an important local architect in the 19th Century. Such structures are a dime a dozen, here. Actually, as some will know, that lack of recognition was a good thing. We didn’t pay a lot for it, mostly because it had original horsehair plaster and lath interior walls (ie no insulation whatsoever) and a mud basement. Not to mention the entire 20 foot front hall carpet soaked with months of cat pee, rotted windowsills, worn-through hardwood floors and a ramshackle kitchen that most folks would not tolerate. And the fact that a large tavern/stripjoint still attracted lots of customers across the street. But my wife Donna saw the charm and with the agreement of an old friend, we bought the place with her, severed our half, and have lived there since 1988. Like a boat, it has been a place to pour money and time into. The mud basement is now gone, dug out by hand and replaced by a fully finished, bright office for me, a utility room and a living room, adjacent to two bedrooms and a bathroom that we added in an addition. Under the mud was the bedrock limestone and we found an (empty) beer bottle, doubtless from the ancient and long-gone brewery down the block, mortared right into the bottom course of stone footings. We live at the bottom of the local hill, which gives us a lovely view of Kingston harbour but unfortunately the basement has something of a river running through it under the gravel and new slab we installed. We have three sump pumps, located in two sumps, and during dry times they cycle perhaps once an hour or so. When the monsoon strikes, however, it is, well, a different story. We flooded the first time during the 500-year ice storm that hit in 1998, knocking out power for weeks in some places. Got a generator then (!). Anywho, in 2016 I thought the water in the sump in my office had changed quality. It had been very dry, so I at first figured it was just stagnant, but over time it really became murky and smelly. Finally, it became clear after I poured some tracer down the sink that there was a sewer leak somewhere outside the house and sewage was flowing back into the sump through the (ancient, stone) footings from outside. Called the City Utilities Corporation who sent a guy to scope the pipes. He opined that there was, indeed, a break outside and it was our problem to fix it, not theirs. Ok, we had a feeling that might be the case, so we got a quote from a contractor that day (a Friday) and he turned up promptly 0730 on Monday morning to begin work, which would involve digging a seven-foot deep trench and replacing the connector pipe from our house to the sewer main under the adjacent sidewalk about ten feet away. Before they could begin digging, however, a City Utilities employee turned up and called a halt to everything, saying they were now not sure where the leak was and wanted to double check inside the house. That took another day. Nope, it was where the first guy said it was. Then they decided that the pipe actually was on their property and they would then do the work – we would pay for the inside stuff. Fine with us, of course! Finally, on Thursday, the City contractors (same guys we had originally hired, now working for the City, natch) started work and by 5 pm had trenched, replaced the pipe and reconnected the sewer. All good. What they had not done, however, is repair the fifteen inch-wide hole punched through our poor old stone wall to replace the connector joint, or fill in the big trench, or make any sort of barrier or berm where the trench cut through the sidewalk and curb to the street. Or cover over the trench in case of rain. It does sometimes rain in Kingston, and in fact the forecast that evening was for a thunderstorm. I had mentioned the urgency of completing the job to one of the Utilities Corp. managers (September is hurricane season, even in Kingston) but they downed tools at 5 pm and vanished. I arrived home half an hour later and tried as best I could to stuff the gaping hole with plastic sheeting to at least prevent raccoons from getting in overnight, but there was nothing much I could do about the seven feet deep by three feet wide by ten feet long trench itself. After having spent many fruitless hours the previous days haranguing them to get on with the work, it seemed perfectly useless to now try to get them back on an emergency basis on overtime. The inevitable happened. It poured rain. Did I mention that our house is at the bottom of a hill? In fact the only storm sewer on our side of the street for two full city blocks lies on the downstream side of the new trench leading to the gaping hole in our basement wall. We slept like babies, all unsuspecting that when I went down to my office in the morning I would step into the remaining sludge from 2,000 gallons or so of street and sewage-contaminated mud that had flooded into the house and been pumped out. I was a tad shocked. Called the insurance folks and the Utilities Corp. The adjuster took a few pictures, frowning, and said, “Well, we aren’t going to cover this claim. Can’t really call it sewer backup when it came inside through that dirty great hole!” Then the City folks said they were going to consult their legal department. Thanks fellas. So we consulted ours. It took 18 months, but we got them to cough up enough to refinish the basement through small claims court. There is an NDC in the settlement that prevents me from alluding to how much that was. But it was just us against the $500 per hour big city lawyers, three of ‘em, and the Utilities Corp. manager who had the effrontery to lie about the course of events. The judge didn’t buy their nonsense, that we householders were in charge and therefore they had no liability. Ridiculous, yes? They could have just done the right thing and paid for the repairs directly. Would have saved all the lawyer fees and court costs (all taxpayer funded, of course). I think we were lucky. And we were without our basement for 18 months. I was in the middle of my doctorate program in history and moved what I could into a 6 feet by 6 feet cubicle upstairs. I can attest that it was painful, all around. But take heart and stiffen your spines, all ye who have been wronged by government. The wheels of justice do grind slowly, but in our case, they ground fine enough.